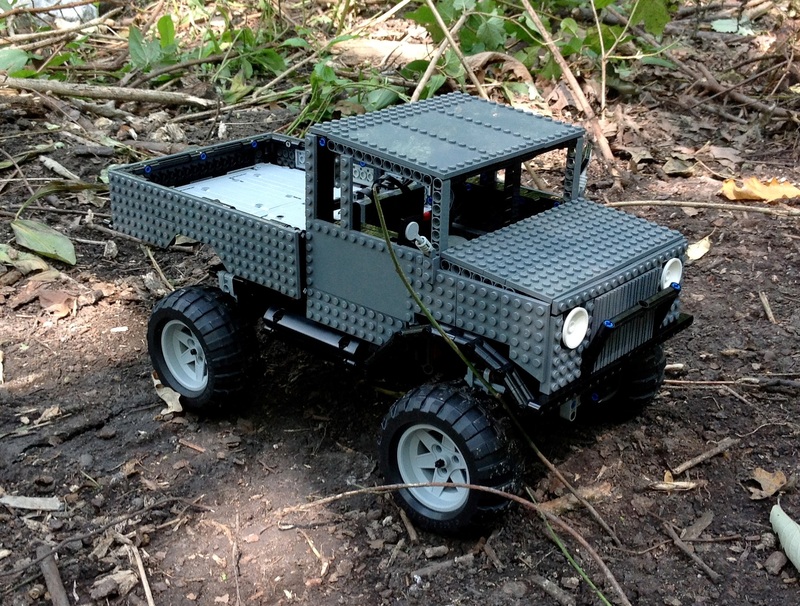 After doing a lot of non powered builds, it was time for me to do something motorized. I very much enjoyed doing a forklift a couple of years ago, so it was time for another one. See the full gallery on Flickr and Brickshelf. The JCB930 that I did a couple of years ago was non-motorized and had some great features. I wanted to build something with all the same features, and since I would need more room for all the electronics, I decided early to model the forklift after the Kalmar mid-sized 180 model. 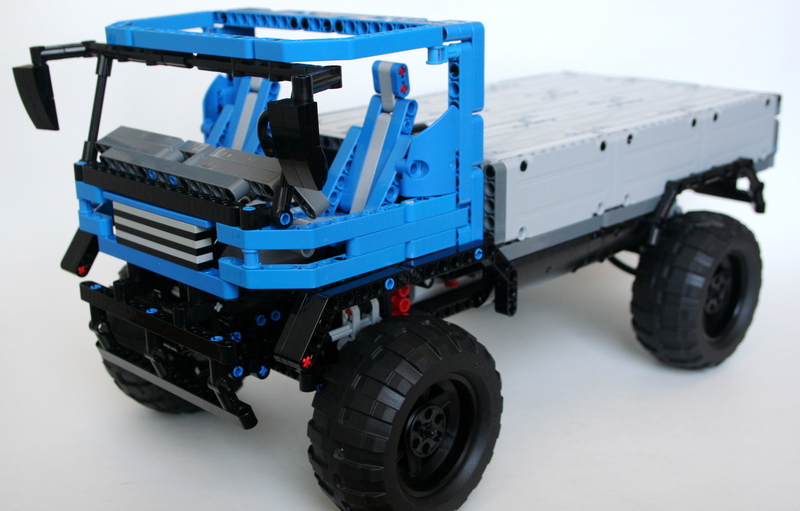 The model would have drive, steering, a two stage lift, and fork tilt. I did not realize how hard this would be. I wanted to keep the boom clear for visibility, and the forks not more than two studs in front of the wheels to keep integrity of scale. I set the scale and I went to work. After setting the chassis measurements, I went to work on the fork and boom. I knew I wanted to have a two stage boom, and I wanted to keep as much of the boom open as I could. The forks connect through the middle of both the first and second stage booms, and pinch both together. The middle boom is has a gear rack on both sides to lift the forks. This boom has two gears at the top, to route the chain over the top to move the forks. The outer boom is connected to the chassis at the bottom, and two mLA connect to it operate the tilt. After some working, I was able to get the boom to be thin, and just how I wanted. I decided early that I want to keep the motors out of the boom. So I had to route the lifting function out to the forklift body through the bottom pivot. This required routing the lifting axle under the drive differential. 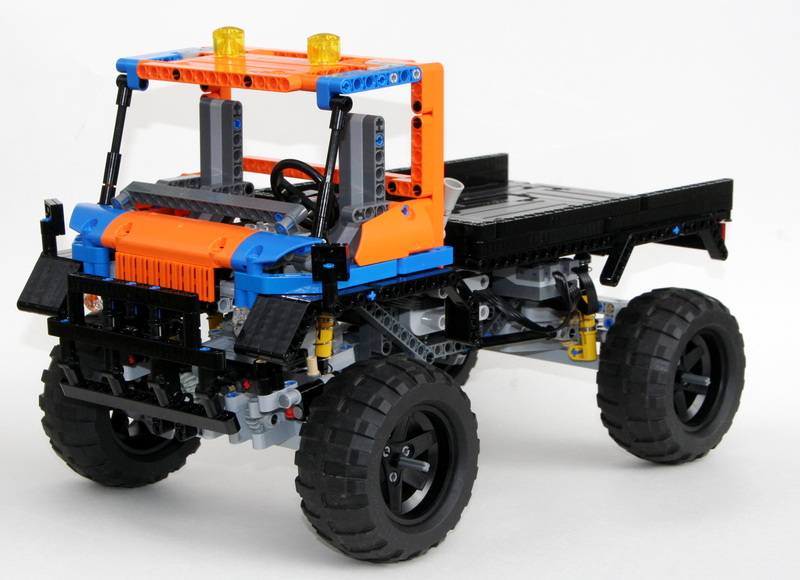 The lifting axle then move rearward, and connected up to a PF L motor. On top of the lifting axle was the drive axle. 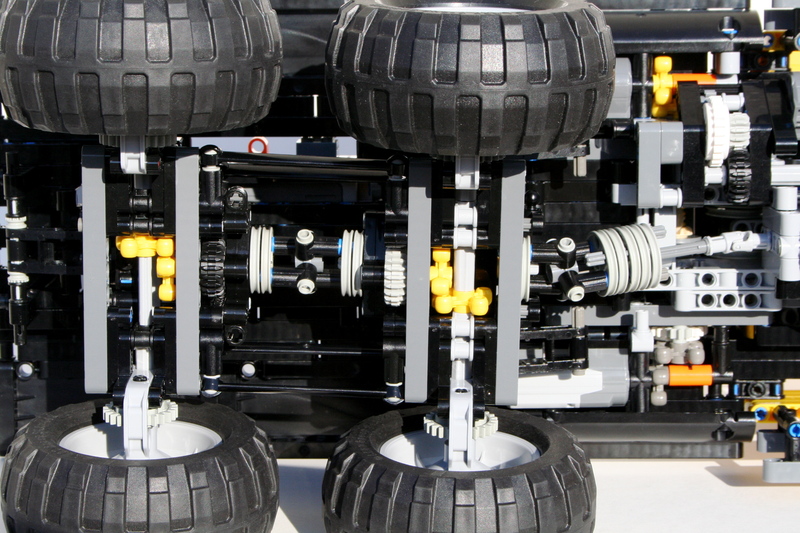 The PF XL motors was mounted transversally on the right side, and drove and axle forward to connect directly to the differential. 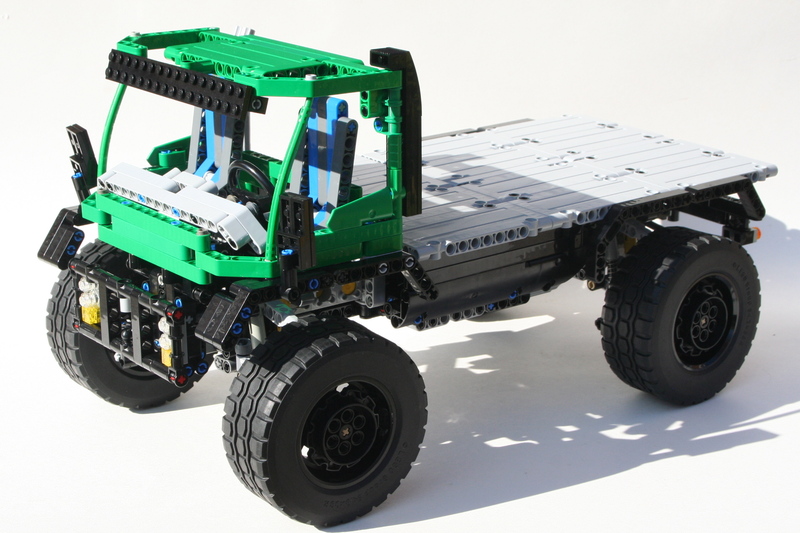 To give me some additional space at the front, a portal axle was mounted on its side to move the differential rearward. A PF Servo was mounted in the rear, over the steering axle, and drove the steering function. 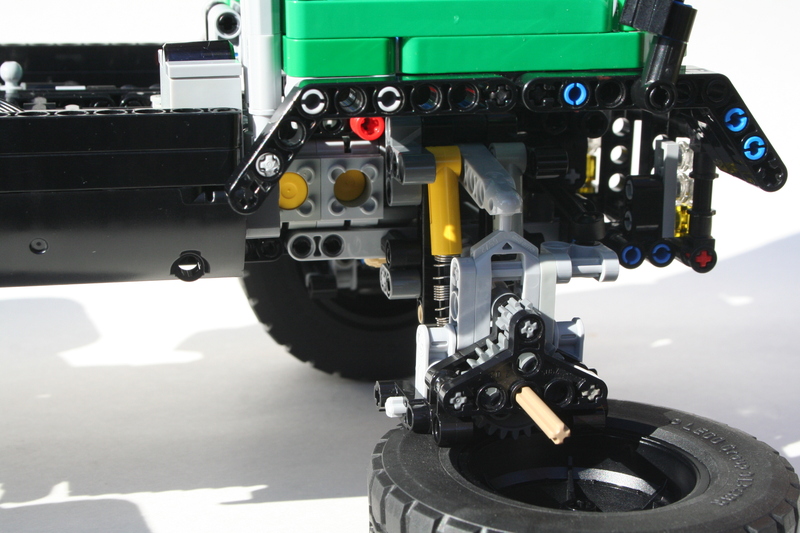 The steering uses some 2×4 liftarms mounted at an angle to allow for a better steering angle. Finally, a PF M was mounted in front of the Servo, under the cabin to drive the tilt function. None of the mechanics were difficult, but the packaging required a number of drafts. The final hurdle was the body work. I spend a lot of time early in my MOCs working on packaging placement, so I do not have many body work problems later in the build. Still, some simple SNOT work was needed on the side sills to fit about the battery box, and the XL motor. Oh, and the wires. The cab was pretty straightforward, but still took a little bit of time. Finally, I had some trouble with the rear engine cover and counterweight. In the end it was a simple design that I settled on, but I tried many designs. Again, this took a lot of time. It took a long time, but I am pleased with the final product. The functions worked smoothly and consistently. The control that was afforded by the fork functions was great. It could lift three AA battery boxes at a time. The steering was quick, and had a great lock which gave great maneuverability. The XL motor provided adequate power, and moved the forklift well. Finally, the bodywork represented the original Kalmar well. I hope you enjoyed as well. At any given time I have about 4-6 projects going on at a time. This is partly the result of the Queue, which is partly the result of my lack of focus. In the midst of all this planning, I find it therapeutic to sit down, and start something small, simple, and without a plan. Two weeks ago, right after finishing the ATS, I sat down, and in a couple of hours, completed a small windrower. The full gallery including instructions may be found here. 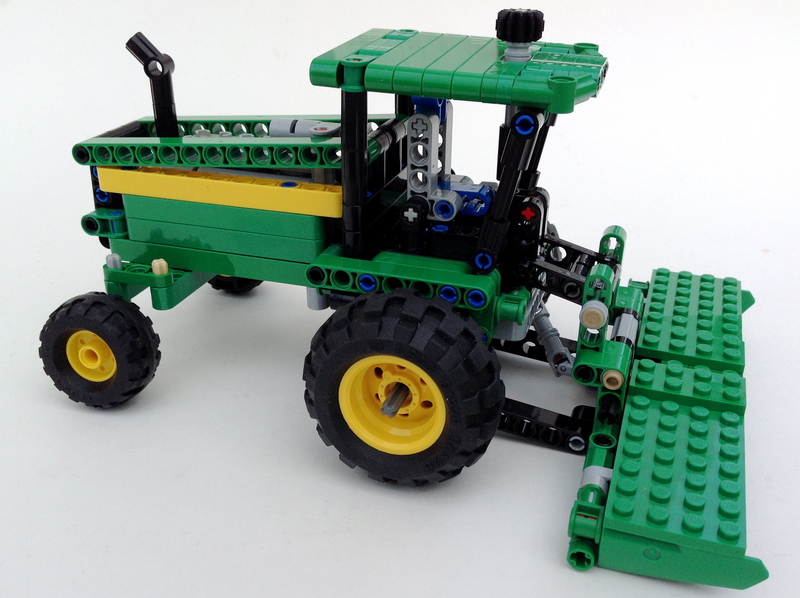 Some of my favorite MOCs are the smaller non-motorized ones I have done over the years, like my Feller, my Octan F1, my 4×4 8081, and my Sod Harvester. I built the Windrower to fit in this theme. A Windrower, or Swather, is basically a large lawnmower. The blades on the front cut down hay, and pull all the cuttings to the center to make a row of cuttings, or windrow, to be picked up later. My version is rather simple. The two main wheels are connected to a center differental through two 8z portal axles. 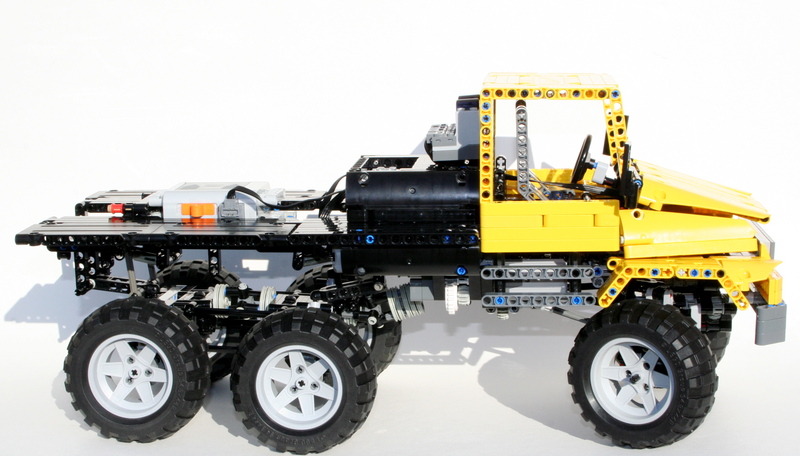 The differential drives a small I3 motor in the rear, and a PTO driveshaft comes out the front. 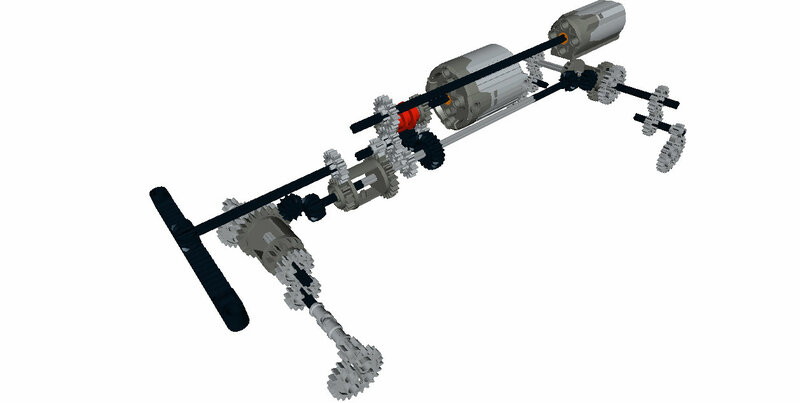 The PTO drives a simple harvesting head made of four z24 gears which are connected with a number of z12 gears. The harvesting head can be raised and lowered by a simple worm gear setup. A simple steering system was created for the rear wheels, and it was connected by a liftarm to the smoke stack so you could control the steering. 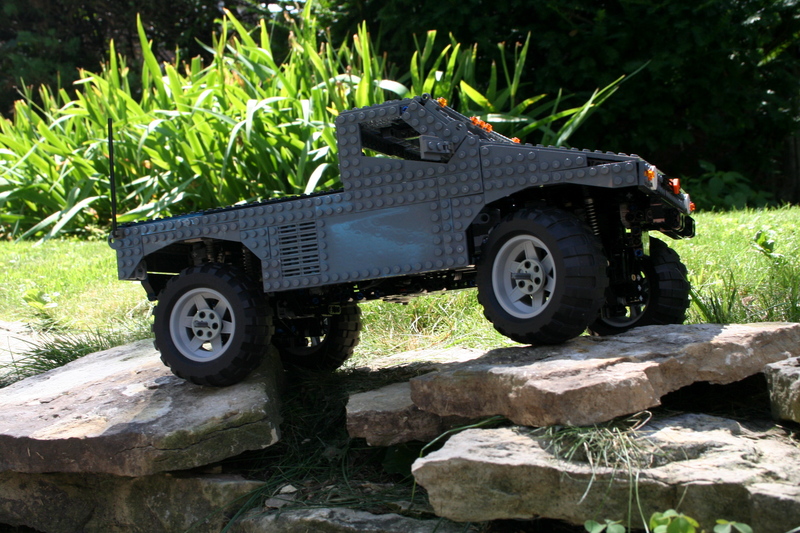 The body work took a couple of Bricklink.com orders. After recently making a couple of MOCs in red, I felt the Case IH coloring would be a little redundant, so John Deere Green it was. My collection of green is growing, but there were still some parts needed. After everything arrived, I replaced all the red, and added some yellow wheels, and everything was set. 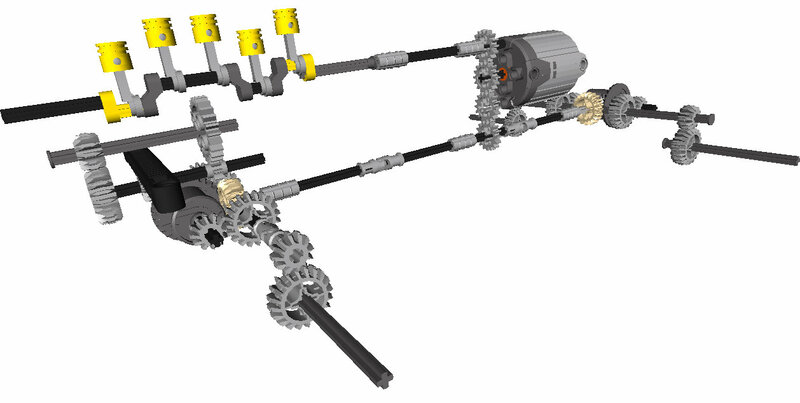 A simple MOC, with some fun features, and an infrequent color.